Western Potash Corp. (TSX:WPX)(FRANKFURT:AHE) (the "Western", "the Company") is pleased to announce that a Memorandum of Understanding for Strategic Cooperation was signed on September 29, 2015 at Vancouver's Four Seasons Hotel by China Development Bank, Western Potash Corp., and Beijing Tairui Innovation Capital Management Ltd., ("Tairui"). Among those attending the signing ceremony were Mr. Hu Huaibang, Chairman of China Development Bank, Mr. Geoffrey Chang, Chairman of Western Potash Corp., with Mr. Xu Ming, President of the Beijing Branch of China Development Bank, Mr. Patricio Varas, CEO of Western Potash and Mr. Xue Wenye, President of Tairui signing the Memorandum of Understanding respectively. China Development Bank is a Chinese policy financial organisation, with a focus on the development of international business, and remaining in the top position among Chinese banks with respect to international investment and financing. 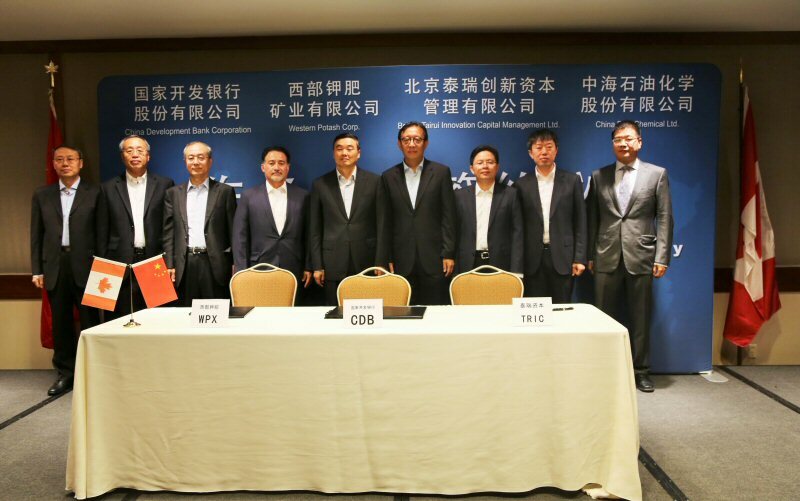 In his speech at the signing ceremony, Mr. Wang Gefan, Chief Operations Officer of China Development Bank said that Tairui and China BlueChemical Ltd. have responded positively to China's national investment strategy by taking the lead among Chinese companies in developing the first Potash project in Canada. This not only serves as an excellent example but also provides numerous benefits to both China and Canada. China Development Bank is willing to support Tairui and China BlueChemical Ltd. in their efforts to develop overseas markets to grow and accelerate their business. China Development Bank will bring its comprehensive financial capability to the project in co-operation with Western Potash Corp. in the mining industry in North America. Except for statements of historical fact relating to the Company, certain information contained herein constitutes "forward-looking information" under Canadian securities legislation. Forward-looking information includes, but is not limited to, statements with respect to the successful development and advancement of the Pilot Plant on the Milestone Project, and the intended use of proceeds from, and the anticipated benefits of, the Transaction. Forward-looking statements are based on the opinions and estimates of management as of the date such statements are made and they are subject to known and unknown risks, uncertainties and other factors that may cause the actual results of the Company to be materially different from those expressed or implied by such forward-looking statements or forward-looking information. Although management of the Company has attempted to identify important factors that could cause actual results to differ materially from those contained in forward-looking information, there may be other factors that cause results not to be as anticipated, estimated or intended. There can be no assurance that such statements will prove to be accurate, as actual results and future events could differ materially from those anticipated in such statements. Accordingly, readers should not place undue reliance on forward-looking information. The Company does not undertake to update any forward-looking information that is set out herein, except in accordance with applicable securities laws. To view the photo associated with this press release, please visit the following link: http://www.marketwire.com/library/20151006-WPCOctober6L.jpg. About this company Western Potash Corp.
MOU Signing Ceremony, September 29, 2015.